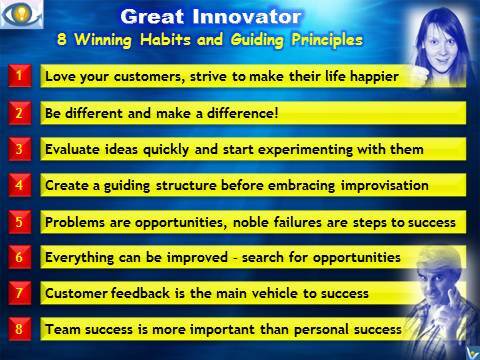 Great innovators find new treasures and take as much as they want. The ability to evaluate innovative ideas and make strategic decisions quickly is a vital habit of a successful opportunistic entrepreneur. 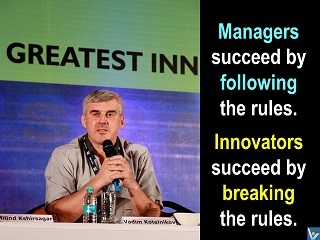 Innovation is about taking risk and learning from failure and market feedback. Rapid experimentation helps to move forward innovative projects in which the vision of where to go or the process of getting there is blurry. Google’s 'launch early and often' strategy helped the company develop the Internet’s number one search engine very fast. Beta testing and market learning is the reason for Google’s remarkable success. They launch less than perfect services into the market place to get market feedback. Feedback is the answer to dominating a market. Innovation is Love. Dream big dreams, commit to you true passion, and you will learn to fly! If you love what you do, there are no difficult tasks, only interesting ones. The secret of winning in life and business lies in seeing things differently – in their different shades and outcomes. It was by taking a different view of a traditional business that major innovations were achieved. "Never forget that only dead fish swim with the stream.," advised Malcolm Muggeridge.